There is an ironic God that speaks in tongues inside my head, I believe this voice is male. Nonetheless, I am for sure one them folks on the road, and I do have a code to live by. Generally, my code is to tell my story simple, direct, and honest, and to never hide behind a lie, to be man enough to be me, and not what you want to hear. 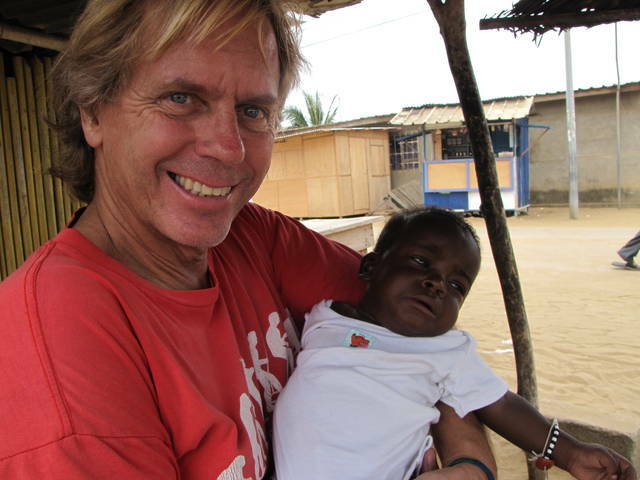 I cannot imagine lying to this little baby in my arm in Cote d’Ivoire, West Africa. I cannot imagine lying to the full size adult children in my life anywhere I meet on the planet, and for sure it would be stupid to lie to readers, yet it feels to me that 99 percent of travel writers want to tell you something more than real, never just life on life’s terms. I went to a place called Plan B the other night, and a girl I was talking with, tall skinny and nice told me she had five children. I had not reason to doubt her, he even gave me what I thought was her number. I told Ani about the five children, and she said that this was not true. Well, a long story short, the girl told me a long lie, completely trying to be in control of nothing. I was hurt to think, this girl has no code, she will lie for no reason, I was further hurt to think that people around me would indulge her, or believe this was good or clever. It is quite obvious, many people have a code, quite different than mine. I walk away from people who believe this is good, clever, and never look back, life is simpler when I keep the idiots downstream from my path. And it for sure, there are many people who did not have parent, to teach them well, but there is always time to take a different path, or change your stars. We all need a code we can live by, never lecture nor talk down to others, this is a 'shortcoming' I require to rein in every day. I have a friend from UK on Facebook, she is having problems these days, yesterday she went onto the wrong group on Facebook for her and was told she is no living in 'hell' for not mending her ways. I am to travel in 3 weeks, I got a lot of the information I required today, no lectures, no philosophy, Sometimes you beat your chest a lot, sometimes you eventalk down to people online, it seems, I may be wrong, make your reader feel good, make the reader feel passionate. If I need a lecture I'll galdly go to teh University and pay for one, if I require a sermon, I will go to church or synagouge, if I need solid travel information and directions I know where to go. saludos y buena suerte.